Makhdoom Minhaj Ke Dil Mein Jaga Banany Ke Liye Kya Zarina Sotan Ki Olad Ko Paal Paye Gi? Virassat is of a political background, juggling to obtain the Waris of Virassat. The story begins with the handing over of the virassat to Makhdoom Mihaj, which is quite persuasive, reflecting his conflict with his step mother, young however. The main reason of the conflict stands as Minhaj does not have any son from his two wives but he has a step brother, a threat for his Virassat whose existence he never ever tolerates. The story enters into a new generation where the same conflict is observed. 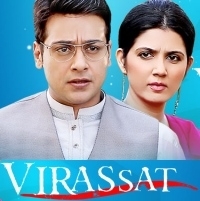 On this page: Virassat story, synopsis, wiki and details about the tv show.